Photo measuring 7 x 5 inches. The back is covered with mounting traces from being glued into an album. Photo is undated and unidentified, but see comments below. Today in the U.S. we have a national holiday to honor the birthday of Dr. Martin Luther King, Jr. (His actual birthday is January 15, but his official commemoration is the third Monday in January. And I explain all this because quite a few of my blog’s subscribers are outside the U.S.) In honor of the holiday and King’s legacy, I thought I would post a photo representing black achievement (if that doesn’t sound too reductive). This one jumped immediately to mind. Since the photo is unlabeled, I have to rely on clues contained within the image. Most of it is very hard to read. So, as always, thank goodness for my scanner’s ability to enlarge things, and the world of information on the internet. 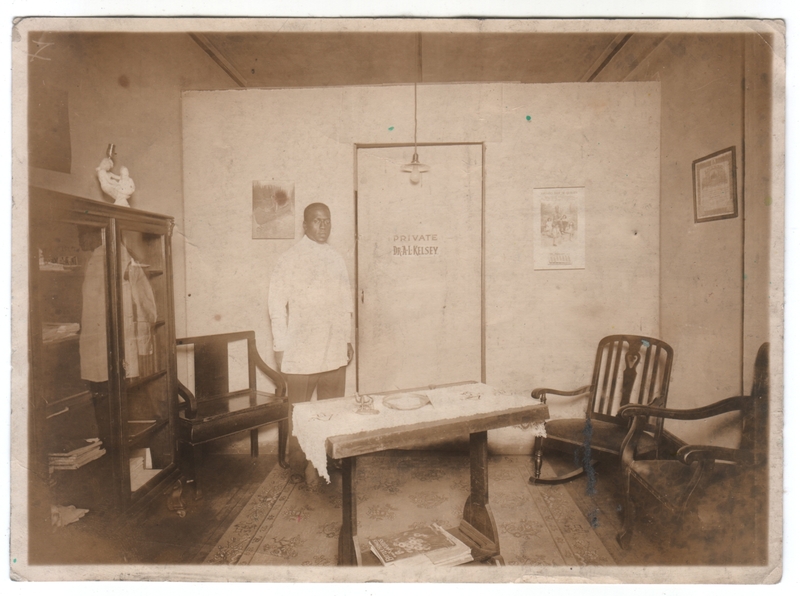 First, I’m operating under the assumption that the man pictured here is the same Dr. A. L. Kelsey whose name is on the door, and that this is the waiting room for his practice. Given all that, what sort of medical man is he? Where is this? When is this? To start with, I blew up the wall calendar as best I could. It was easy enough to read February, but the year was harder. Using the configuration of the numbers on the calendar grid (the first of the month on a Tuesday, not a leap year), I went back through an online calendar site and found possible years, one of which was 1927. Thinking 1927 was probably a good match, I Googled cover images of Better Homes & Gardens from 1927, and found that the magazine under the table is indeed the February 1927 issue. Then I moved on to the certificate on the wall to the right. All I could read easily were the words “License” and “Registered”. I finally was able to make out “Board of __ Examiners”, but I couldn’t read the word that would fill in the blank. I think it’s too short for “Medical”. “Dental” is the right length, it seems to match what letters I can see, and I would guess that’s a dental smock he’s wearing. Beyond that I can’t make out anything, or find certificates on the internet that match the document’s insignia. So then I Googled his name with “dentist”. I found an article from a 1958 “Jet” magazine noting the accidental death of the wife of “Dr. A. L. Kelsey”, identified as “a prominent Atlanta dentist”. Same guy? And if so, is this Atlanta? Or even Georgia at all? With Georgia in mind, I went back to trying to match up the certificate, but came up empty. As another location clue, the wall calendar is from a place called Jordan’s Shop of Quality, but that lead didn’t pan out. So that’s as far as I got. I believe he’s a dentist named Dr. A. L. Kelsey, this photo is from February 1927, and the location may possibly be the Atlanta area. I could probably move on to studying census data or something, but that’s enough for now. As for other details that I could only see when blown up, the image on the wall calender appears to be Abraham Lincoln talking to a group of children, the image on the wall to the left appears to be an Indian maiden in a canoe fishing with a spear (more romantic than the Lincoln portrait, and less apt), and the items on the table include a shallow bowl with papers (maybe mail?) and a statue of a camel (of all things). By the way, this photo’s date of February 1927 means it was taken nearly two years before Dr. King was even born. Great detective work! What a fascinating image. Thanks, Paul! It’s fun to do. If only more photos came with such clues. Absolutely fascinating! I wish we could see behind the door and check out his equipment! I agree! By the way, is it an optical illusion, or does the wall containing the door not actually go the whole way to the ceiling? If so, then the only privacy it would afford would be visual. I know, it’s amazing what a difference the internet has made. Previously it must have involved so much time and energy, plus guesswork. Granted he’s fiction, but Sherlock Holmes was always being referred to as having published monographs on various topics for detection, like the analysis of various types of tobacco ash, that interested parties would presumably purchase and shelve for their own detection needs. Police departments and government agencies would have greater resources at their disposal to interview people and make painstaking searches of document archives. But somebody like me, a layman with nothing at stake beyond unsatisfied curiosity, would likely stop before he started. 1) I think you might have missed your calling as a P.I. 2) I was thinking he looked familiar, like some actor, but I couldn’t place it. I see what you mean about John Amos since you mention it. 16 Jan 2012 at 9:22 pm M.O. He does look like John Amos. I’ve always liked him in “Coming to America”. Matt, what a treasure this photo is. As always, your detective work is impressive! Thanks! I’m glad you like the picture. Having these photos and doing a little research into them is fun for me, but I’m definitely glad there are people like you out there with whom I can share this interest.